Today (21 February) at the Kia Oval stadium EE displayed one of a fleet of 32 4x4 rapid response vehicles (RRVs) that will be used to provide temporary coverage for the Emergency Services Network in the event of flooding, power outages and other incidents that could knock out part of its permanent 4G coverage infrastructure. The fleet will be stationed around the country near the small number of areas which are served by single sites rather than overlapping coverage, to meet the requirement of bringing ESN coverage back up within three hours. The vehicles, which are equipped with 11.5 metre tall masts, can provide coverage at either 800 MHz or 1,800 MHz, depending on whether coverage or capacity is more important. The in-vehicle coverage solution takes less than 30 minutes to set up and the RRVs are equipped with 2kW diesel generators and an uninterruptable power supply fed by 10 minutes of battery cover. It is envisaged that the vehicles could be deployed for up to three days at a time. 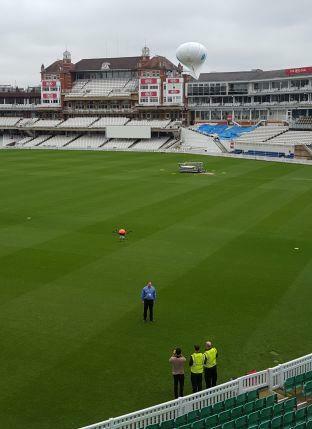 Within the stadium, EE flew both an unmanned aerial vehicle (UAV) equipped with a basestation and antenna that could be used to provide targeted coverage and a helikite, which is equipped with a 5W small cell solution from Nokia. The latter will be used to provide wide area 4G mobile coverage where permanent sites have been damaged or in areas where there is no 4G coverage and can stay up for weeks at a time. The UAV is expected to cover up to one kilometre, be up and running within 15 minutes and stay in the air for nearly an hour. 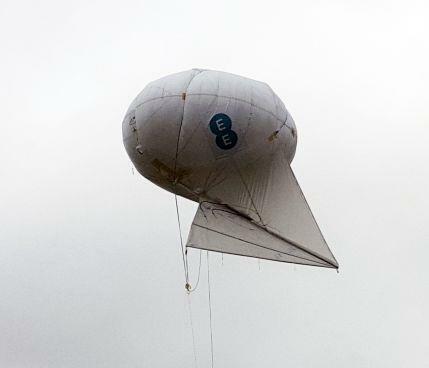 EE expects to deliver a deployed balloon solution in a rural environment in 2017. EE’s tethered and powered mobile ‘air mast’ solutions are currently in patent-pending status. Mansoor Hanif, director of converged networks and innovation at BT, said that BT is working on a winged drone concept, which is more robust and can carry a heavier payload. “We believe we can use that UAV to carry spare parts for the fixed network and base stations”, with a possible use case being serving islands, where ferry service can be intermittent and helicopters might not always be available. He believes that it might be possible to get response times down to half an hour if EE is allowed to experiment with UAVs. Both aerial solutions are not part of EE’s efforts to meet its obligations to the Home Office for the ESN project, instead being intended for its commercial network. However, Hanif sees a role for UAV solutions in situations where RRVs cannot reach areas without coverage due to flooding or damage to roads. 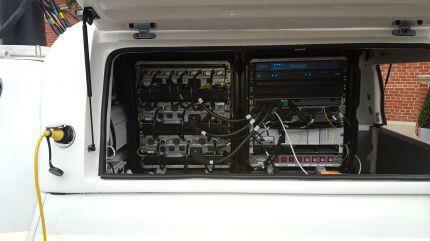 During a press conference, EE demonstrated a VoLTE call over the helikite’s small cell, using satellite backhaul. Data speeds weren’t shown but Hanif said that EE has tested up to 50 Mbps speeds in the field. Two journalists in the room spoke to each other during the call without any issues. EE’s breakthroughs in aerial solutions development have been achieved with the support of a number of partners. Nokia has provided lightweight, compact and portable Flexi Zone small cell basestation solutions; Parallel Wireless has delivered a self-configuring and self-optimising basestation, in-band backhaul capability, and network meshing techniques; Avanti has enabled a fast, reliable satellite backhaul connection; VoltServer has provided touch-safe and flexible Digital Electricity power over data cable/tether; uVue has designed UAVs to meet the specific requirements of providing mobile coverage; and Allsopp Helikites has provided the ‘Helikite’ solution. EE CEO Marc Allera said: “We are going to extraordinary lengths to connect communities across the UK. Innovation is essential for us to go further than we’ve ever gone, and deliver a network that’s more reliable than ever before. Rural parts of the UK provide more challenges to mobile coverage than anywhere else, so we have to work harder there – developing these technologies will ultimately help our customers, even in the most hard to reach areas. Hanif said that while they believe the tethered aerial solutions don’t require regulatory changes, the same would not be true of the coverage on demand service that Allera is proposing and this would require the involvement of Ofcom and the CAA. Land Mobile asked him as to how concerned EE is about the possible use of UAVs to attack fixed cellular infrastructure on rooftops. “We’re equally concerned as everybody else,” he replied. “I cannot see any other solution to this future technology other than connecting them up through our networks. From our network the work we’ve done with the emergency services, we’ve got a mission-critical network, we can prioritise quality of service, we’ve got low latency through mobile edge computing, getting even better with 5G.